A wireless waterproof 13A RC outdoor remote control switch box. Wall mountable boxes by KnightsBridge are a tough, durable remote control garden light switch ideal for use in farms, garages, gardens and Halloween/Christmas Lights. The knightsbridge remote controlled ip66 weatherproof outdoor switch box has an IP66 rating, ensuring protection against water jets and dust from all directions. 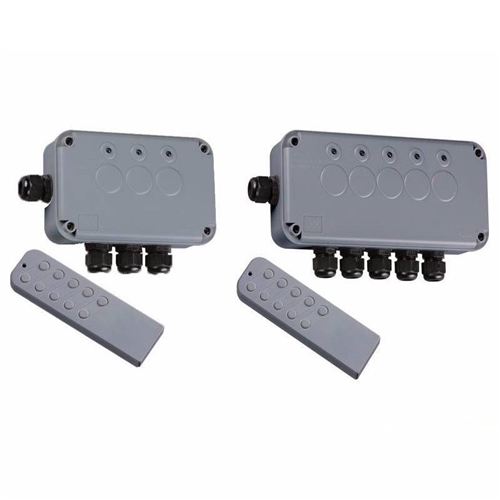 These remote switch boxes feature convenient 20mm cable gland connections. Smaller than others I have looked at, does the job without any fuss. I needed a remote switch for 5 things on my pond. The electrician fitted the 5 gang KnightsBridge unit and it's excellent! I can turn the waterfall off when it's windy without going out! I was thinking of using this in my garage so when i come home at night to bring on the garage light and also the outside light is that ok to do that? Electrical World Replies: Yes we know these have been used to do this and many other applications . We have known customers to wire sirens, pumps, lights and many more items through this. Just check the max wattage of the appliance and make sure it doesn't exceed that of the switch box. In the event of a loss of power e.g. a power cut, when power is reconnected does the switch box resume the supply to the connected devices i.e. Is the supply latched? For example if a pond pump is powered from the switch box, following a resumption of power after a cut, will the pump still operate or will it need switching on via the remote? Electrical World Replies: The Units are fitted with “Un-Latching” relays, therefore, once the power is reconnected, the Hand Controller would need to select the device to be powered again. Electrical World Replies: Hello , thanks for the question. This unit operates via a radio signal (rather than infra red which is more directional.) As long as you are with in the range of the unit it will work but walls etc will reduce the range somewhat. A site test is the only real way to know if the range will work as like all radio signals range will vary based on various external influences. The manufacturer has provided an approx range of 20 meters . We have been told by some customers this can be much more and others have said it worked 15 meters away through their kitchen window! Hi, is it possible to purchase an additional remote control, and - control the box from both conntrollers - in case the original remote get damaged, would I also need to replace the box? I installed one of these for garden lighting and the customer was very happy. She now says she has lost the remote control and has asked me to get a replacement. Would you be able to get one for me please? What is the largest wire gauge you can use to connect equipment to the boxes.